We’ll stop our bellyaching about how Ski-Doo should simply drop the top GSX personal luxury sled and blend it into the MXZ Renegade line, making it more performance sport touring than Grand Touring. 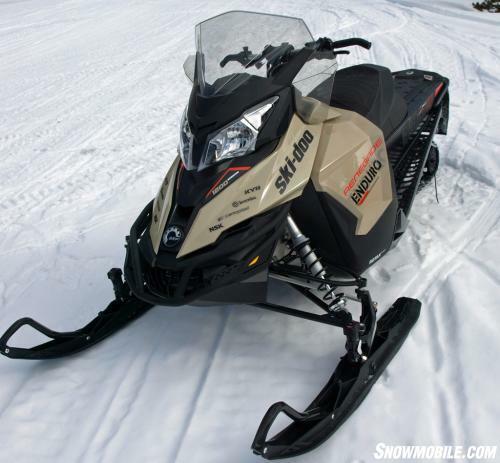 Say adios to the GSX SE 1200 4-TEC and welcome to the 2016 Ski-Doo Renegade Enduro 1200 4-TEC. We liked the GSX, but certain models never seemed to fit in. We just never saw how a real MXZ or Renegade sport rider could cross over to the soft and cuddly GSX. No matter how Ski-Doo tried, the GSX seemed in limbo caught between a Grand Touring persona and minimalized MXZ reality. This year, though, Ski-Doo cleverly repackages the former GSX SE 1200 4-TEC into the very palatable Ski-Doo Renegade Enduro 1200 4-TEC. Although the Enduro retains many of its previous GSX SE luxury touches, the Renegade branding lends it real trail credibility. Despite our snarky comments about the previous GSX SE, we actually liked it quite a bit. Depending on the model year, the GSX could be quite handsomely styled and extremely well-appointed with features to make any long distance trip easy. We preferred the two-stroke drivetrains – either the 600cc or 800cc ETEC twins. We thought the advanced combustion four-strokes felt underpowered at 60 hp for the ACE 600 and even the ACE 900’s 90 horses needed more oats. 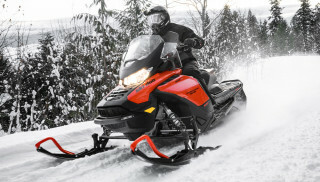 The 1200 4-TEC was okay, but it seemed to make the GSX a Ski-Doo version of the Yamaha Vector. Ski-Doo’s new for 2016 Renegade Enduro blends off-trail Renegade prowess with on-trail features like the Air Ride rear suspension. For 2016 the Enduro 1200 4-TEC hits a higher level of performance. The engine benefits from a re-do that adds multi-mode performance and Intelligent Throttle Control (ITC) and brings the 1171cc Rotax four-stroke triple in line with the ACE engines, which already enjoy three-modes of performance and throttle-by-wire. To get the 1200 4-TEC triple neatly ensconced under the Enduro’s cowling required shrinking the exhaust canister, which allows the Enduro to discard the REV-XR platform in favor of the narrow and more standardized REV-XS. 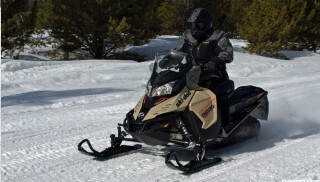 Indeed, all 1200 4-TEC powered Ski-Doo trail sport models for 2016 now utilize the XS platform, which offers a more compact and narrowed front end shape. This design change takes the Enduro away from the GSX and toward the MXZ. We definitely approve. We also approve of what we feel is improved overall performance. Although the updated Rotax 1200 4-TEC didn’t make serious power gains, engine response seems much crisper and cleaner. That is a benefit of updating the engine’s throttle body and the re-programming of its electronic fuel injection system to accommodate the ITC and three-mode performance settings. Ski-Doo claims that ITC throttle action is 45 percent quicker than the previous cable-actuated design when blipping the throttle and 50 percent faster returning to idle thanks to the lighter throttle action. 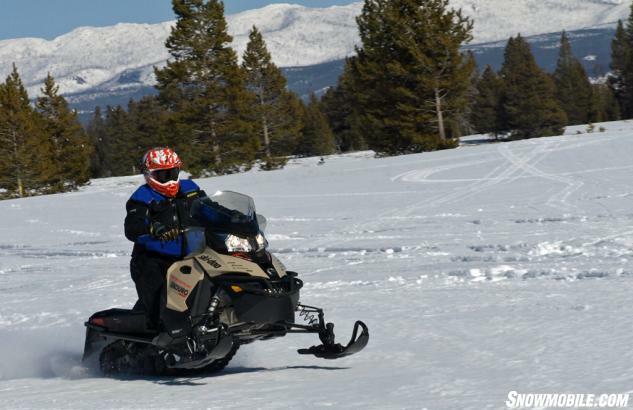 Ski-Doo’s fuel-efficient engines work smoothly with Renegade off-trail breeding to make the Enduro one of the best on or off trail sleds for the upcoming season. • Sport – programmed for full performance with an increase of 200 rpm at idle to pre-charge the plenum for more instant-on power; • Standard – a slightly milder setting with a more linear ramp up for smoother acceleration and improved fuel economy; • ECO – a setting designed to maximize fuel efficiency and minimalize engine performance to enhance overall fuel economy. The Enduro runningboard offers ample boot grip as well as excellent snow evacuation needed when running off trail. On both the Enduro 1200 4-TEC and touring models equipped with the same engine package, we prefer the standard setting. It’s smooth and very trail friendly. If you want to hammer the trails, move to the Sport mode. If you find yourself in ECO mode very often let us know. It seriously crimps the purpose of this sled. The Enduro blends smooth and rider-friendly power with nice-to-have tech features not normally found in an on- and off-trail sport sled. 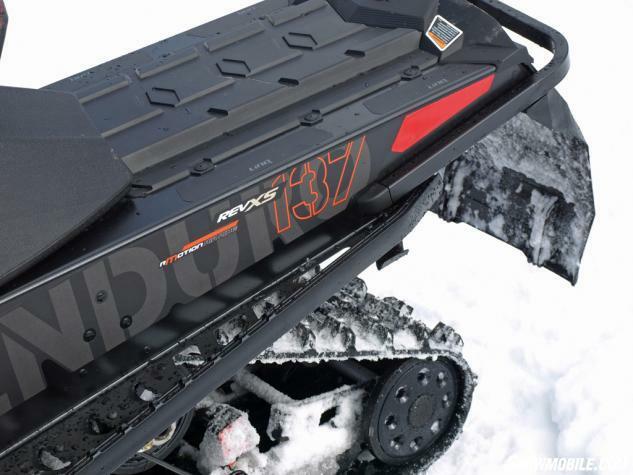 The Enduro’s drivetrain mates Ski-Doo eDrive2 and QRS clutching components to create a very smooth level of performance in this 130-something horsepower snowmobile. Acceleration is particularly strong at low end and mid range, plus that throaty growl coming from the downsized exhaust tells you that top end performance is strong as well. Ski-Doo combined the performance benefits of its rMotion rear suspension with the ride comfort of a handlebar-controlled rear air spring. The 1200 Enduro’s power puts it head-to-head with most 600ccc two-stroke longish tracked models you’ll encounter. Its 130 hp moves its 543 pounds smoothly enough on or off the trail. We suspect the Enduro will be more on than off trail, but with a 15-inch wide by 137-inch long track it can lead the parade and break trail on unplowed forest roads. The standard Ice Ripper XT track features mini-ice stud tips embedded in the 1.25-inch tall lugs. The base design reflects Rip Saw II technology but adds the factory-installed stud tips for added traction and control. 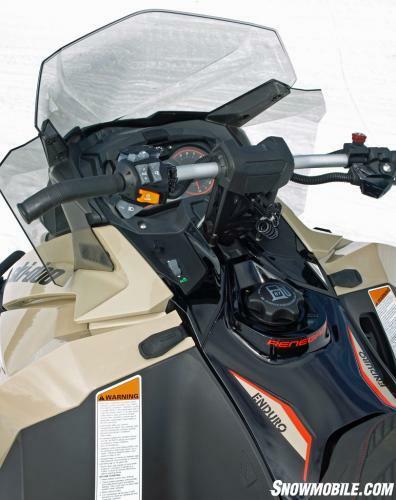 Up front the Enduro benefits from Ski-Doo’s innovative ski technology. 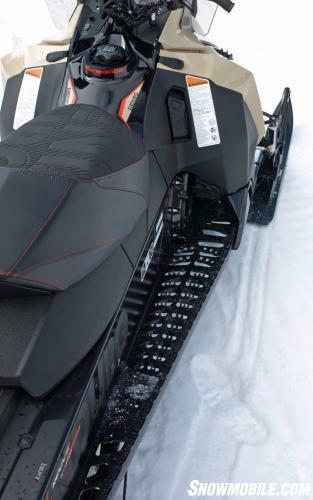 The Pilot TS ski is totally new, innovative and available on select 2016 Ski-Doo models, including the Enduro 1200. Simply twisting the TS ski’s knob allows you to raise or lower the ski blade up to a half-inch. There are 20 clicks of adjustment that are indicated by a gauge on the adjustment stem. You can’t personalize ski bite much better than this. And, it does work. The Enduro’s “born-again” 1200 4-TEC triple enjoys quicker throttle response, improved fuel economy and a slim profile that fits on the REV-XS chassis. We mentioned that the Enduro borrows from the GSX and touring lines. For 2016 the Enduro adds on-trail comfort and rear suspension adjustability with an air-controlled rMotion slide rail system. Fitted with an air spring on the rear suspension arm, the Air Ride suspension comes from last year’s GSX SE. It offers five pre-selected settings that can be changed via a handlebar-mounted rocker switch. We’d be lying if we pretended we didn’t enjoy this feature. We found that the lowest setting is probably too soft for all but the most petite rider. But settings two through four control the vast challenges of any groomed trail. For serious bump action, change up to number five. For a long day’s ride we’d welcome the benefits of this rMotion based rear setup. It works very well. The Enduro offers five stages of air-spring ride and three modes of performance plus the protection of a 15-inch height windshield. That’s the bottom line story for the 2016 Enduro 1200. It works very well. It lets you enjoy a serious high-mileage ride all the while blending in the on-trail performance you want from a quiet and efficient four-stroke drive system with uncompromising ride and handling. The Enduro ups the benefits of the discontinued GSX by adding in performance-oriented features like the aluminum handlebar with J-hook ends, 4.5-inch riser bar, REV-XP X seat, Brembo performance brake and Renegade branding. But, the Enduro retains GSX privilege by retaining the Air Ride rear suspension. Finally we’re getting the GSX we always wanted – a GSX by another name and combination of features that says we are performance riders, not touring riders. After all a real snowmobiler’s ego and sensibilities are fragile. 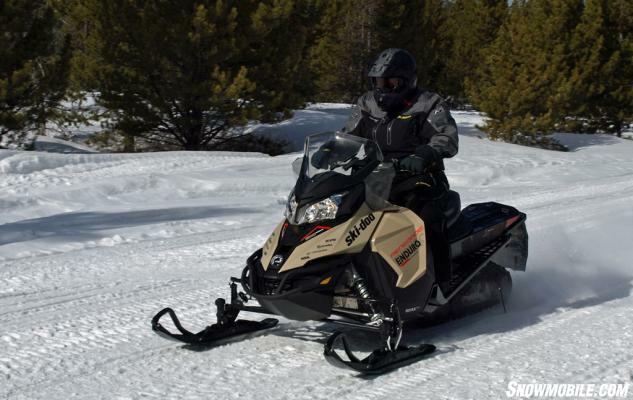 The 2016 Ski-Doo Enduro 1200 4-TEC hits the sweet spot between performance and nice-to-have comfort.